Strain gauges are used to measure the strain or stress levels on the materials. Alternatively, pressure on the strain gauge causes a generated voltage and it can be used as an energy harvester. You will be given either the flapping or tapping type gauge. When you test the circle buzzer type gauge, you will lay it flat on the table and tap on it. If it is the long rectangle one, you will flap the piece to generate voltage. 1. 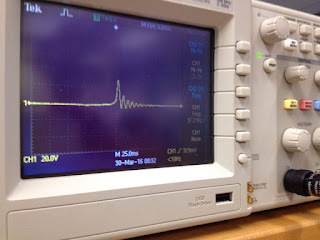 Connect the oscilloscope probes to the strain gauge. Record the peak voltage values (positive and negative) by flipping/tapping the gauge with low and high pressure. Make sure to set the oscilloscope horizontal and vertical scales appropriately so you can read the values. DO NOT USE the measure tool of the oscilloscope. Adjust your oscilloscope so you can read the values from the screen. Fill out Table 1 and provide photos of the oscilloscope. 2. Press the “Single” button below the Autoscale button on the oscilloscope. This mode will allow you to capture a single change at the output. Adjust your time and amplitude scales so you have the best resolution for your signal when you flip/tap your strain gauge. 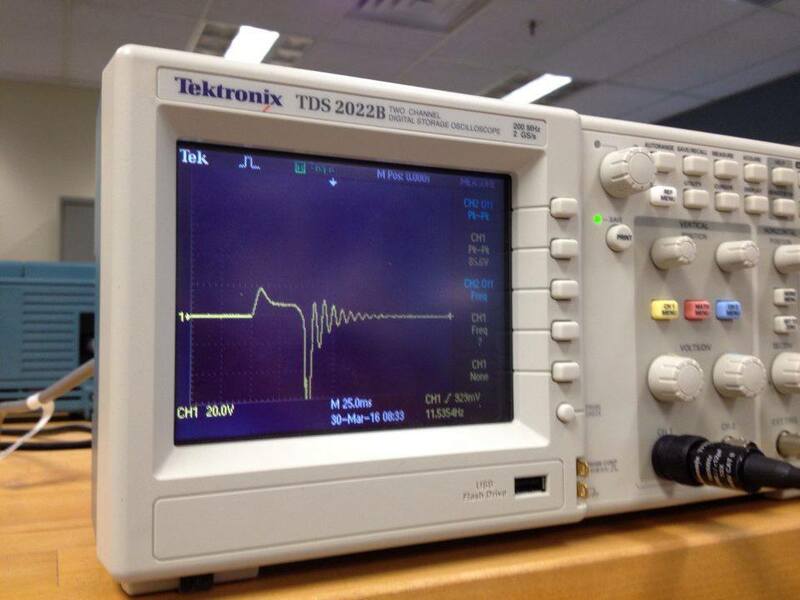 Provide a photo of the oscilloscope graph. 1. Construct the following half-wave rectifier. Measure the input and the output using the oscilloscope and provide a snapshot of the outputs. 2. Calculate the effective voltage of the input and output and compare the values with the measured ones by completing the following table. 3. Construct the following circuit and record the output voltage using both DMM and the oscilloscope. 4. Replace the 1 µF capacitor with 100 µF and repeat the previous step. What has changed? Since no 100 µF capacitor was available, we were provided with a 470 µF capacitor. This is a much larger capacitor and means that we would not see the cap discharge at 1KHz. In order to fix this we had to turn the frequency down. In this case we used 6.3 Hz. 2. Briefly explain your results. The flips on the strain gauge greatly affected the amount the capacitor was charging. With the more flips per second the faster the voltage went up across the capacitor. We even added a higher flip rate just to observe what will happen and the voltage was greatly increased. 3. If we do not use the diode in the circuit (i.e. using only strain gauge to charge the capacitor), what would you observe at the output? Why? Without the diode it doesnt work as well because the circuit is not a half wave rectifier anymore. The diode is needed for the rectifier circuit. Nice pictures for Question 1. And very nice using both channels on the oscilloscope 2 I regret not doing that myself! As well I like your answer for Question 3 perhaps explain why the diode makes the circuit a half-wave rectifier? Looks good. I think for part B 3 and 4, you should be able to measure the mean with the dmm. All of your oscilloscope pictures look accurate. I will look into that, thanks! Hey, David! It's Nick! I'm just commenting on our blog to say hi. Nice job this week, bud! 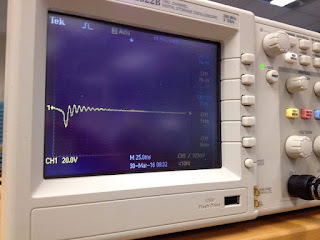 I like the oscilloscope graph that is not a picture. 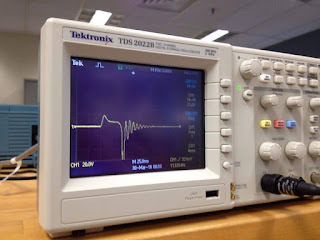 How did you get that graph off of the oscilloscope? You can plug a usb into the scope and take a screenshot of the scope! I agree with Matt and Ben that you can get the mean with the DMM in DC mode (maybe AC mode actually I don't remember). 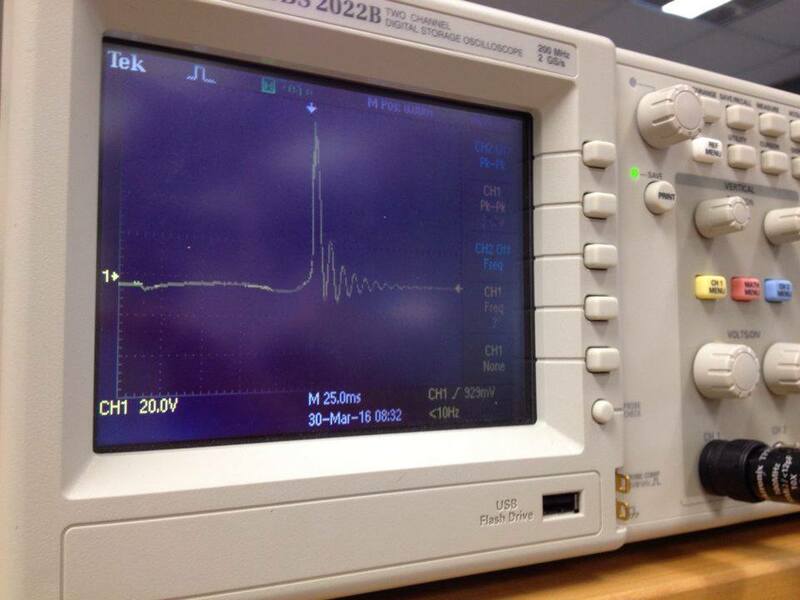 Your oscilloscope pictures are great, I like how you took several pictures at different polarities. I think the rest of your values are reasonable, well done! How was your picture taken for part a problem 2? It's clearly not your oscilloscope but a very great representation still. For the last question, I find it helpful that you didn't just say "without the diode it doesn't work". You also noted that it is no longer a rectifier. Nice observation. For the waveform in problem 2 it is possible to put a usb into the oscilloscope and do a print screen or save it. Its on the left side of the scope. Thanks! Wow how cool! I definitely have to try that.